They're heeeeerree. Well, maybe. Asian carp DNA  but thankfully, no actual fish  has been found in water samples taken from the Chicago river near a pumping station in the Chicago suburb of Wilmette, Ill. In the 1970s, catfish farmers used these hardy foreign carp to remove algae from their ponds. But over the decades, floods that caused catfish ponds to overflow have released the species into the Mississippi river basin. 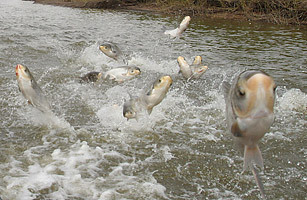 Asian carp can grow to 4 ft. (1.2 m) in length and weigh over 100 lb. (45 kg), and have a tendency to leap out of the water, injuring fishermen and the occasional newscaster. With no natural predators and a predilection for killing off other marine life by eating all the plankton, the carp have overrun the Mississippi and are swimming towards the Great Lakes, the world's largest freshwater ecosystem. An elaborate system of barriers was constructed in 2002 to keep them contained, but the Wilmette DNA sample indicates that the fish have most likely found away around it. In December 2009 the state of Michigan filed a lawsuit against Illinois, which refuses to close the locks along Chicago's waterways. Despite the threat to the multibillion dollar fishing industry, the Supreme Court ruled against Michigan on Jan. 19. Chicago's waterways will remain open for now.